When you are a sleep-deprived new mama, every-little-task is an event! It takes everything in you to get anything done. But, because you’re Mom, the show must go on. This likely means keeping your family well-fed. 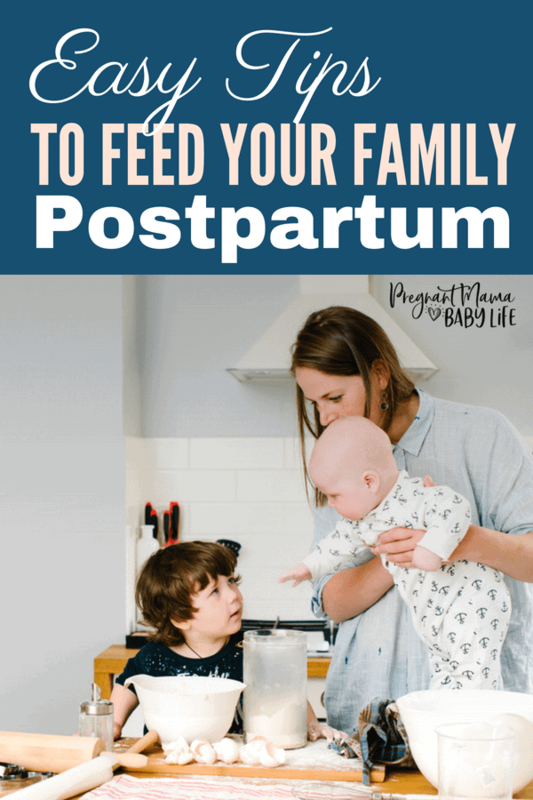 It may seem hard to feed your family well during postpartum, but it is possible. I have a little confession. Before having a baby, I loved going grocery shopping. I would spend a couple hours wandering around, looking at all the beautiful fruits and veggies. Getting excited about what I was going to cook to nourish my husband and I. But after having a baby and being sleep deprived for oh, let’s say going on 3 years now, not so much. The last thing any exhausted mama wants to do is get in your car, drive to the grocery store and battle throngs of shoppers, then come home to cook a 4-course meal for your family. So not happening. So what to do? 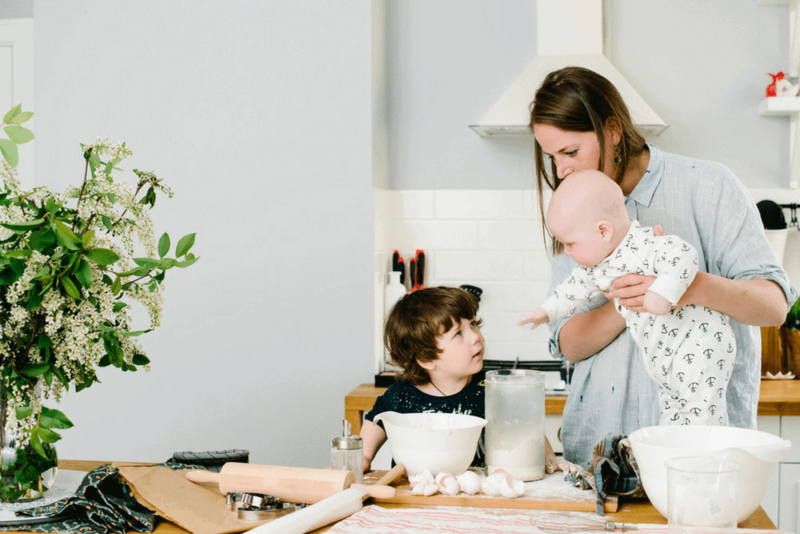 Streamline cooking duties to save you time, and give you time to rest postpartum and bond with baby. Stockpile cooked ingredients in your fridge. 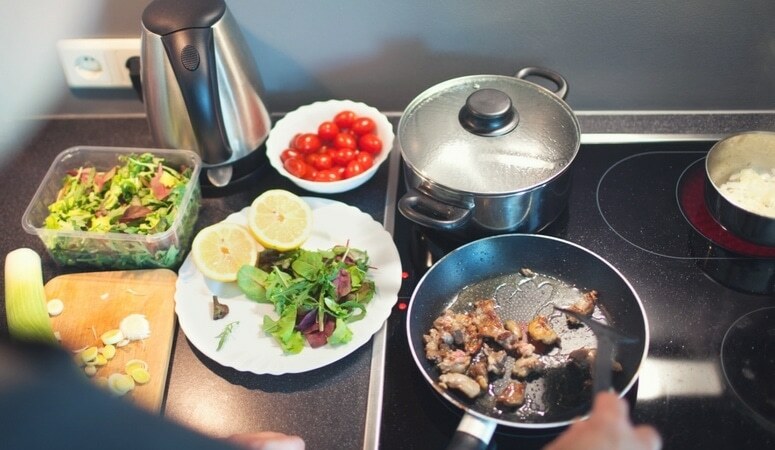 Before baby, you probably thought about dinner in terms of “what will I cook from scratch tonight?” Now it’s all about plug and play ingredients. Start each week by cooking up a big pot of a starch, such as pasta or rice, and a protein, like chicken, or bean soup. Store in the fridge, and as the days wear on you can think of different ways to mix and match what’s in there, adding veggies as needed. Mix and match canned and boxed ingredients. Prepared foods go a long way in keeping dinners interesting. Some good things to have in your pantry: pasta, rice, other grains you may like such as quinoa. Jarred salsa and hot sauce. Cans of beans – think bean soups, or beans, leftover meat, veggies and pasta. Cream soups for casseroles. If you can get these convenience foods organic, do so! There are lots of great products out there now that are much healthier than they use to be. Frozen veggies are fresher. Sure, you may want to have fresh salad ingredients such as lettuce and tomatoes handy. But did you know that frozen veggies are actually more nutritious because they’re frozen at the peak of freshness? Plus, it’s so much easier to open bag of frozen broccoli, warm it up and add to a casserole or stir-fry, than it is to clean, peel, chop and cook the broccoli yourself. And let’s be honest here… if you don’t have time to grocery shop for fresh foods, it’s better to have nutritious frozen foods then getting sucked into desperate unhealthier options. Again, if you can afford to go organic in this area, I suggest that too. Since its difficult to wash frozen veggies well, it’s best to go with pesticide free. Give your leftovers a makeover. For example, if cooked a big chicken dinner with rice and veggies, night 2 can be chicken soup with a little pasta and some carrots and green beans added, and don’t forget to freeze some for lunch servings. Night 3 can be chicken tacos with the leftover rice, plus black beans and melted cheese – with possible leftovers for lunch. Night 4, maybe you have a little of the chicken left over to add to a stir-fry with frozen veggies. Make frozen dinners. (Think healthy, DIY T.V. dinners.) If you’re reading this while still pregnant, then that’s perfect. Now is the time to think about cooking one-pot meals and casseroles that you can freeze in single-size or double portions. It’s like creating your own, homemade TV dinners. To prep for a big cooking event, shop for lots of staples like favorite veggies, proteins and starches that you can mix and match for different meals. Think soups, stews, meat, bean and veggie medleys served over rice or pasta. Stock up on small storage containers that will keep in your freezer. Also get a permanent marker and sticky labels so you can mark everything with the contents and date when it was cooked. There are some great tips by Birth Eat Love for making healthy postpartum freezer meals. This will help you make yummy, healthy meals that are nourishing for your body, and will help your milk supply too! If you haven’t tried ordering your groceries online, now is the time to start! I order often from our local grocer, and they even deliver. Many big chain grocery stores at the very least, offer in store pick up. Even Amazon has gotten on the bandwagon! The time you save is amazing! If the idea of grocery shopping with your little one sounds terrible, then definitely look into this. Although, if you have a calmer baby, getting out of the house may not be such a bad thing. But if this food frenzy dwindles down after a while, don’t hesitate to ask for help, especially if you’re struggling with breastfeeding or caring for a preemie around the clock. Family is usually more than happy to help during times like these! Postpartum is really tough. Feeding your family well is tough! Doing both at the same time, OMG. Your body is healing, your sleep deprived, everything has changed in an instant. Make sure you are going easy on yourself! You are only one woman, and no matter how easy others may make it seem, it’s not! Do the best you can, no one is expecting perfection! How to Rock Your Postpartum!